Rock and roll has been funny for a very long time. There were the novelty songs from the 50’s like Purple People Eater and Polka Dot Bikini. There was the wit and sarcasm of John Lennon in the 60’s and as we all know, the 70’s and 80’s were prime time for “Weird” Al Yankovic and acts like Gary Mule Deer. The merging of music and comedy probably had its roots back in Caesar’s Palace and medieval England. The Fool would bring out a lute and serenade the court with songs about chastity belts and philandering knights. Of course, in those days if you did not please the King and his court, you were most likely beheaded. In the business that is what we call a tough crowd. Cut to the present. “Weird” Al is as relevant as ever, witnessed by the huge sales and response to songs like “Tacky,” his play on Pharrell’s “Happy.” Billy Joel and Bruce Springsteen, who are both known for doing marathon four-hour concerts, always slip in a funny tune or a story that sounds like something you would see on Comedy Central. Then in the 1980’s there was a comedy boom that changed the face of comedians everywhere and suddenly comics achieved the status of rock stars. Andrew Dice Clay, Sam Kinison and Richard Jeni were packing the clubs, theatres and arenas like Madison Square Garden. And in one of those clubs, right here in New Jersey, a career was born with a guitar and one word – EEYES! The venue was Bananas Comedy Club and the performer was Gary DeLena. And guess what folks…He’s back! 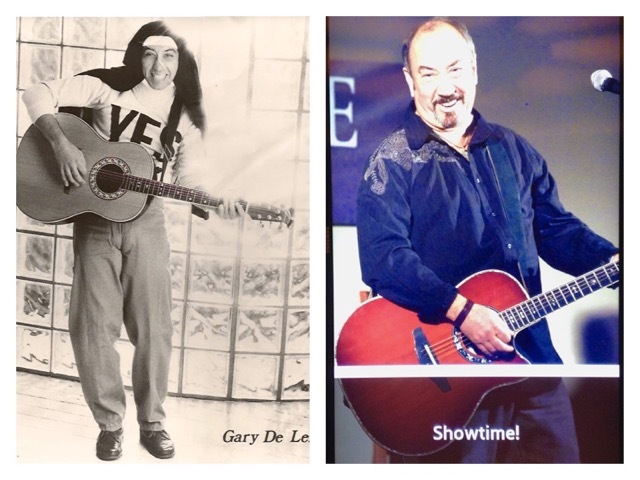 For one weekend only, on September 16 and 17, Gary DeLena will be bringing his groundbreaking comedy rock show to Hasbrouck Heights. This is a Do-Not-Miss opportunity. You will see Elvis, Richie Valens, the Animals, The Stones, Beatles, Troggs, Rod Stewart, Billy Joel, Simon and Garfunkel, Neil Young, the Who, Keith Urban, Willie Nelson, the Monkees, Carrie Underwear and Bill Clinton! (don’t ask, this you have to see for yourself). The music is flawless, a testament to Gary’s prowess on the guitar, the vocals are not what you’d expect from a comedian, and the lyrics are both relevant and relatable. And funny! Did I forget to mention funny? Mr. DeLena has taken his act to Avery Fisher Hall at Lincoln Center, Caroline’s and the Comedy Cellar in New York, the Improv and Comedy Store in LA, as well as theatres and clubs from London to Toronto and every US city from coast to coast. On television he has rocked MTV, VH1, A&E, Fox, CBS, HBO and Showtime. With guitar in hand he has entertained thousands and those who’ve seen him, always come back for more. Bananas Comedy Club has the distinction of being one of the original comedy venues in New Jersey, dating back to the early eighties. During the ensuing decades it has given a start to acts like Jerry Seinfeld, Ray Romano, Kevin James, Louis CK, Chris Rock and Jamie Foxx. It continues to present the top names in the business every Friday and Saturday night. This month is no exception. Fresh from a run at the Music Box Theatre at the Borgata Hotel & Casino in Atlantic City, Gary is geared up and ready to rock you. And will he make you laugh? EEYES!